Cut each eggplant in half lengthwise. Scoop out flesh, leaving about ½-inch "wall." Dice scooped-out flesh and saute along with veggies in the stuffing mix. Preheat oven to 350 degrees F. Line a baking sheet with aluminum foil. After the stuffing is prepared and in the bowl, mix in the mozzarella cheese. Fill cavity of eggplant with stuffing, dividing stuffing evenly between each eggplant half. 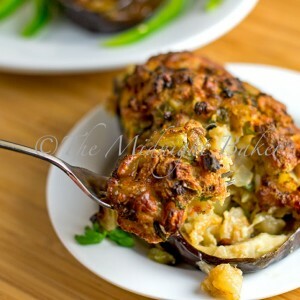 Place eggplant on prepared baking sheet and bake 20-30 minutes or until eggplant is soft and stuffing is browned on top.